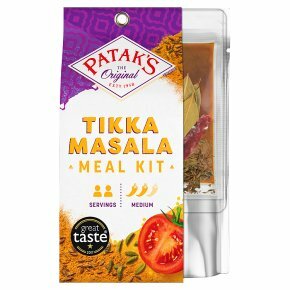 Individual Sachets of Creamy Tikka Masala Sauce, Aromatic Tikka Masala Paste and Whole Spices. Chilli rating - medium - 2. Great taste 2017. A rich, creamy tomato curry inspired by recipes from the Punjab State of Northern India. 3 simple steps! No artificial colours, flavours or preservatives. Suitable for vegetarians. This Tikka Masala Meal Kit is inspired by the State of Punjab in Northern India, a region famous for its rich and creamy curries. The spices chosen to complement this dish are typical of the curries in the Punjab State: Cumin Seeds - Cumin has a very distinctive strong and spicy aroma with a rich and slightly bitter flavour. It is used in snacks, appetisers and vegetable dishes. Green Cardamom - Grown in the western Ghats mountain range it is commonly referred to as the 'Queen of Spices' for its distinctive, lemony, floral flavour. Ginger - Ginger is an underground root, in its fresh state it's most often used as pulp. Adding it to a dish will add a distinct flavour with a pungent fresh aroma. Dried Red Chilli - Chillies range in heat from mild to very hot. The heat comes from capsaicin in their seeds and inner white membrane. Dairy helps with mellowing spice. Turmeric - To create powder, fresh turmeric is boiled in water and dried in the sun before being ground. It has a warm flavour and a vibrant colour and is the 'soul' of many Indian dishes. This product must be cooked. Just Add Diced Chicken Thigh (300g) Vegetable Oil (1tbsp) Water (50ml) 1 In a pan, gently fry the whole spices in 1tbsp of vegetable oil for 20 seconds. 2 Add the Patak's Paste with 50ml water and gently fry until the water is almost evaporated. Add meat or vegetables and fry until sealed. 3 Stir in the sauce and simmer for 15 minutes or until the meat is cooked through. If using beef or lamb allow to simmer for 30 minutes until tender. The whole red chilli is hot, so leave it out if you prefer a milder curry.